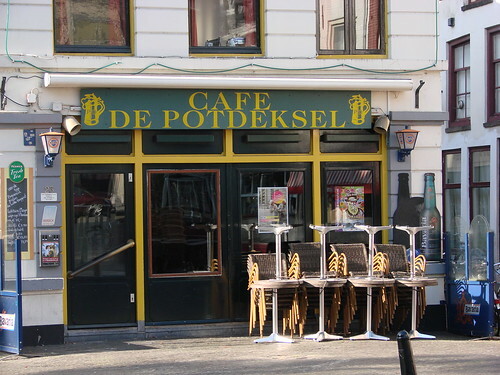 Last night was Quiz Night again at the Potdeksel. As I’ve mentioned before, the quiz is in Dutch, unlike some of the other quiz night’s in town, although we’re fortunate that René is the quiz master, so he’s kind enough to translate when we don’t quite understand some of the questions. We can sometimes get the basic words, but lose the meaning due to the word order, so we’re making progress with understanding the language, but are a still quite a ways off from understanding properly. There were seven teams competing last night and in the end, we came out sixth for the evening. Not too shabby, since we still beat some natives. Although I suspect that was due more to the fact that we’ve got at least four years on the two who lost, so we were able to do slightly better on the music round, which was songs from the 1980s last night. Despite my love of ’80s music, I still didn’t do too well on that round.